If you have searched for a merchant account based on “low rates” or “discount rates” you’ve probably seen companies that offer a $500 rate guarantee. They tattoo the advertisement across the home page of their website like a proud mother posts pictures of her newborn baby on Facebook. Or $250, or $100. The dollar amount is insignificant. It should be painfully obvious to anyone interested in challenging a company on this guarantee that the company offering this is only interested in using this offer as a hook to get your business and NOT to pay out the $500. So with that, don’t you think they will find every reason in the book not to have to cut a check? Before we even go any further, the moral of this story is to consider your buying criteria. Sign up for a merchant account under criteria that matters to you rather than falling into a slick sales tactic that won’t end up coming true. 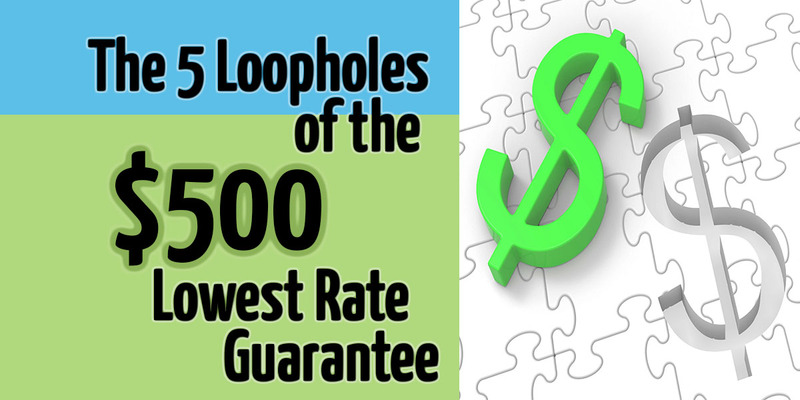 If you read the terms and conditions of the lowest rate guarantee, you’ll find that the company offering this amazing deal inserts a number of technicalities into the wording of the guarantee offer ensuring that they rarely (if ever) will have to pay out as a result of not being able to beat another providers rates. The language of this makes it obvious that they are not interested in making the savings worth while to you, they are just covering themselves in case you already have a really good deal that they can’t beat. If they save you even $.01, that constitutes non-payment of the $500. Does this mean that there will be a savings in all categories or just one? This isn’t specifically covered so it leaves room for interpretation on where they are able to save you money. Is it only in the transaction fee category? Is it in the percentage (discount) rate category? Maybe it’s just in the monthly statement fee section? The implied savings is for the overall fees to be lower, but all of the guarantees that I have read and reviewed don’t specifically say that. 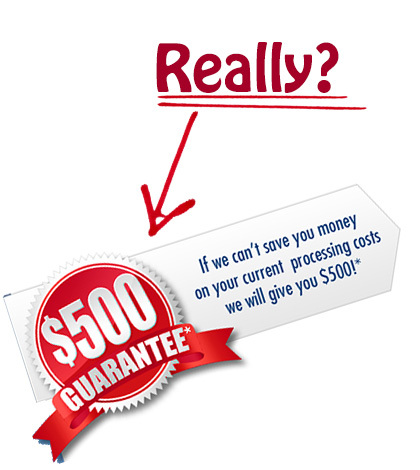 The $500 offer is based on the PROPOSAL ONLY and not actual processing. When you submit your processing statements for analysis, the company is able to propose a savings to you based on percentage rates and speculated card types that they estimate to be true. Since there are many different pricing structures that vary among merchant account providers, card types with one provider will not necessarily mean that you pay the same rate with a new provider. In other words a qualified transaction with a rate of 1.79%, for example, might be equivalent to a mid-qualified rate of 2.29% with a different provider. There’s really no way to tell until you make a switch, so the important thing to remember is that the proposal is all speculation. Assuming that you would make a switch and start processing with a new provider, the written proposal does not guarantee you anything. If the written proposal said $50 monthly savings how will you know if you have saved anything the next month? Furthermore it’s highly likely that your processing volume is never the same from month to month. One month you could process $35,784.39, the next month you’ll do $38,023.43 and the corresponding fees are going to be different. You’ll have different card types, different customers, a different number of transactions/sales so you’ll never be comparing apples to apples. This is the biggest reason that you can ONLY monitor your effective rate and NOT a specific rate. This isn’t even addressed in the guarantee. Let’s give the company the benefit of the doubt for a minute and say that they actually did improve your rates in month number one. Does it hold true in month number two and three? Maybe. How about 6 months, a year, or two years down the road? Who knows where rates will be at that time and will you have a dedicated account representative to address your questions and concerns at that point? Remember that rates change 2 times per year and merchant account companies adjust rates periodically to simply increase provider markup. Your promised savings might be short lived. This is such a classic adage but is so true in many cases. Doing business with a company who is going to lure you in with a sneaky money saving offer is not likely to take care of you and your business when it counts. Playing the pricing game when shopping for a merchant account can and will often result in an unstable business relationship. It’s like building a home on a foundation of sand. Do you have what I refer to as the Walmart pricing mentality? How much is good service worth? I know that you take pride in your business, so don’t fall into the trap of shopping on rate alone. Buying on price alone is a race to the bottom. The lower the price, the lower the quality of service. I’m sure you wouldn’t shop for a baby sitter on price so why would you choose a vendor on that criteria? If you’re having trouble finding a provider that will answer your questions, schedule a one-on-one consultation with our team and we’ll build a custom solution together for your company.